Following the battle between government troops and extremist groups in 2017, Marawi City could only dream of getting its former status back. It was once distinguished as the economic hub of Lanao del Sur and the center of Islam in the country. Today, the business district and the surrounding barangays have been reduced to rubble. This recent photo of ground zero of Marawi City—which is composed of 24 barangays—taken by the author (inset) shows houses crumbling, dilapidated, and filled with bullet holes. Mayor Majul Gandamra said the city government is doing all its best to help the internally displaced persons. Homes of well-to-do families, including Marawi Mayor Majul Gandamra’s, were demolished by blasts or damaged by artillery. It’s the equivalent of the Makati Central Business District and its surrounding elite villages being bombed out. In spite of the spoils of war, some cultural icons have remained, such as the scenic Mindanao State University and the “torogans,” the traditional Maranao homes with intricate carvings. On a personal initiative, Gandamra, his family and friends donated 46 hectares of land for settlements, consisting of temporary shelters built by the National Housing Authority and the municipality. Many poor families who were displaced during the war have returned to Marawi and have moved into these homes. In Barangay Sagonsongan, families have occupied 1,050 temporary shelters. An additional 300 houses are being put up. Of the 1,500 temporary shelters in Barangay Boganga, 600 have been turned over to other residents. Meanwhile, a thousand homes in Barangay Dulay are on the rise. The temporary shelters are just the start of Marawi’s urban renewal, which officials said could probably take more than a decade. The five-month Marawi siege was said to be the country’s longest urban war. Fighters of ISIL (Islamic State of Iraq and the Levant) and the local radical Islamic groups of the Maute and Abu Sayaff tried to conquer the city, including the capitol building. When the siege began in May 2017, Gandamra, his immediate family, and his staffers were holed up at the city hall. “It was the target of the ISIL and the Maute so that they could conquer [the city] and install their flag. They were well equipped and tried to kill us, but we stood our ground,” the mayor said. “The City Hall is the symbol of our sovereignty. Our retaliation was calibrated. After four days, the military strengthened our forces. We were then able to extricate ourselves from the city hall,” said Gandamra. The mayor and his family have since been staying in their other residence in Iligan City, Lanao del Norte, which is 38 kilometers or an hour’s drive from Marawi. Unable to sack city hall, the extremist groups took over Marawi’s central business district instead. “There was least resistance there,” said Gandamra. While government forces bombed several areas, 95 percent of Marawi’s residents fled to their relatives away from the city or lived in evacuation centers. The battle ended in October 2017. Gandamra said out of Marawi’s 96 barangays, 72 have tried to return to normalcy. Over 800 households are still staying in evacuation centers outside of Marawi. 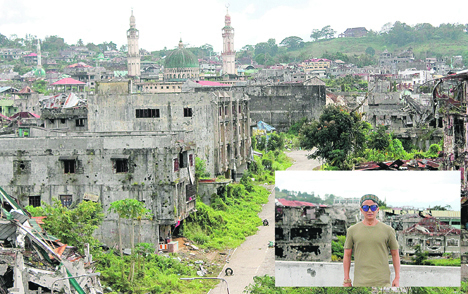 Task Force Bangon Marawi, comprised of various government agencies, is slowly working on the rehabilitation of Ground Zero or Marawi’s devastated city center.